we communicate, the position paper of Action Against Hunger on climate. As climate change aggravates humanitarian crises, bridging the humanitarian development gap becomes increasingly important. This includes building resilience to reduce needs and supporting sustainable livelihoods to adapt to future shocks. These discussions also highlight the numerous unsolved issues around human rights in humanitarian contexts and particularly with climate change induced displacement. 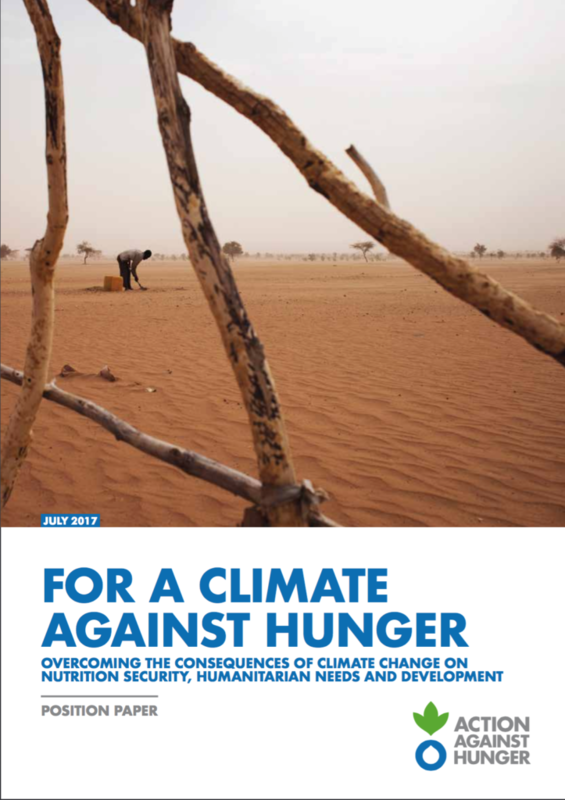 Action Against Hunger recognizes that the impact of Climate Change could be disastrous and undermine years of progress in the fight against hunger and malnutrition. As a humanitarian and development actor working to eradicate hunger and under-nutrition and meet the sustainable development goals (SDGs), Action Against Hunger is committed to promote policy changes to improve the humanitarian system, international development assistance, and national and international climate change frameworks and initiatives. The report in English, is available here. This entry was posted in Publications (VEN) on 7 September 2017 by Alternatives Humanitaires.